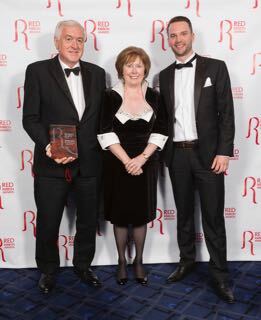 Parker Plant Hire Ltd, a plant hire firm from Llanelli, Carmarthenshire was announced as UK winner of the ‘Best Business to Work for’ award at the prestigious Red Ribbon Awards at London’s iconic Wembley Stadium held on 15th July 2016. The Red Ribbon Awards organised by Family Business Place celebrate the UKs most exciting, innovative and successful family businesses, from all four corners of Britain. The Company was formed by the Parker family in 1980 and to this day remains a family owned business employing approx 50 personnel. They own one of the largest independent plant hire fleets in Wales and from its base in Llanelli and depots in Cardiff and Pembroke Dock they are able to cover all areas of Wales and beyond. Parker Plant Hire have achieved a turnover in 2015 of in excess of £5m with an impressive range of operated/non-operated plant, site accommodation and specialist tools and equipment. Community support & responsibility is also close to the company’s heart. Parker Plant Hire supports a number of local and Welsh charities and organisations from local charities/ sports clubs to larger institutions including Mencap Cymru, Hywel Dda Health Charities and National Eisteddfod of Wales. Barry Williams, General Manager added “We continually strive to adopt best practice in safety and learning/development, recognising that people are our most valuable asset and their performance is vital to the quality of service we provide”. 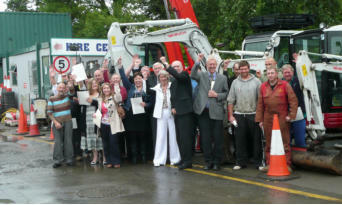 Parker Plant Hire was the first to achieve the Investors in People Gold Standard within the construction sector in Wales in 2013 which they have successfully retained in 2016. Parker Plant are proud winners of a Training and Development Award at the Carmarthen Journal and Llanelli Star West Wales Business Awards 2016. Runners up included TRJ Ltd and Rescue 365.